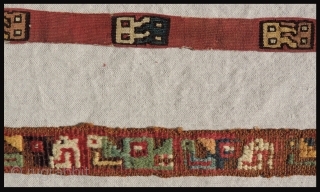 Three Pre-Columbian textile strips. The earliest piece dates to b.c.200 - b.c. 100. The two other pieces date from a.d. 500 - 800. All are very finely woven and about 20 inches long. Images include avian and feline figures. The early Paracas/Nasca culture strip depicts a bird of the owl family known as a Nightjar bird or Goatsucker bird and is worked in fine embroidery of camelid fiber yarns. 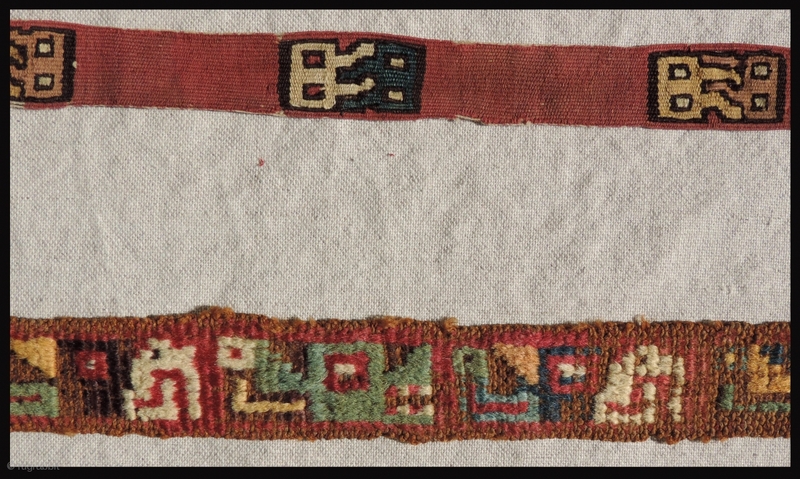 The two Wari culture weavings, one a tapestry woven strip and the other a pile woven headband convey raptor, feline and abstracted intertwined faces. Other good Pre-Columbian textiles can be seen on my pages.